Most all Deadheads are familiar with the 1969 “Live Dead” album. To a certain degree, this record represents a watershed moment in the band’s history, showcasing the true “live performance” magic of the Grateful Dead captured on vinyl. Not only does it possess quite possibly the highest of all musical events in all Dead folklore with the 02/27/69 Dark Star, but it also goes a long way in writing the book on the rest of the material contained on the album. While it could be argued that it was all downhill for Dark Star after this LP version (no, I’m not attempting to make this case myself), such is not the case with Lovelight. Its evolution had gotten well down the path by the time they played the version used on the record (January 26, 1969), but it was not nearly complete. As 1969 moved along, Lovelight continued to grow, stretching its boundaries not only in duration, but in creativity as well. By the summer of 1969 the song was bursting at its own seams. It is often the case when listening to old tapes of Grateful Dead music, that you can be struck by the fact that what you are hearing never made it onto a commercial release, and thereby, into mainstream society. It is not uncommon to hear music so good, you can’t believe it only lives by the grace of a sub societal sect that cared for and shared this music fully outside the scope of a record label and commercial industry’s ability to present it as an example of a band’s musical identity to the “outside” world. This tends to happen at a higher than average ratio when it comes to 1969 Grateful Dead. And June 14th, 1969 exemplifies this in spades. As this show begins, we can hear everything known to be archetypically “Lovelight,” and a good deal more. Jerry’s leads give the appearance that he is a daredevil tightrope walker, fearlessly charging forward while blindfolded and balancing several tea cups on saucers across each extended arm, each of these holding aloft a feather-strewn lady sitting in a chair – like some twisted and distorted Dr. Seuss character. He has no concern which way the tightrope turns, bows, or buckles. He’s confidence radiates for miles. The song rolls like a river charging through the wild west terrain of America, great frothing whitecaps boiling over boulders, long swaths of orange and mustard brown silt running like ribbons under crystal glass cover. We are delivered to more remote and twisted vistas than the commercially released Lovelight might ever have dreamed of. Pockets of imploding feedback, great yawning taffy-like pulls of guitar-dinosaur moaning, and strobe light exploding curtains of color adorn the music while Pigpen’s improvised truck driver love poetry sprinkles a consistent thread throughout the 26 minute opening bookend of the show. When the song sneaks its way into Me And My Uncle, the unmistakable aura of Grateful Dead magic pervades everything. We are defenseless as the band casts its controlling energy over the entire hall, happily lost in their hypnotic trance. Me And My Uncle crackles with a psychedelic power unfairly permeating a simple cowboy song. Bobby’s vocals quiver and tremble with their edgy glimmer, and Garcia’s guitar work is like a tumbleweed caught in a tornado. The Dead’s ability to superimpose one musical genre into the fibers and tissues of another in 1969 was nearly unequalled in any other year. Here in the summer of ‘69, the band was already headed down a creative path toward the formation of the “Acoustic Dead” which would fully play out through the winter and well into 1970. Yet at this time the titanic lysergic beast of 1968 still shrouded even the most traditional of songs, and often made it a more brain twisting challenge to reach stable ground in even the most straightforward of music. 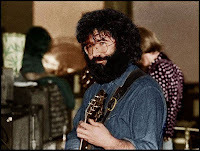 As Me And My Uncle deposits us directly into Doin’ That Rag, we are immediately thrust into the belly of the beast again, and Garcia is in as fine vocal form as he’s been on guitar up to this point. He’s delivery matches Bobby’s with its certain crazed and bug-eyed intensity. That Jerry Garcia could sing a song! His voice paints a Cheshire Cat smile into the air. Doin’ That Rag is so overflowing with the symbolism that pervades the veiled and subtle messaging of the Grateful Dead, it’s a shame that the song could not have secured a more stable home in the Dead’s repertoire. It flashes forward to Robert Hunter’s lyrical majesty contained on American Beauty, crafting pictures and imagery into a poetic mural of spiritual grace, lessons to learn, and endless snapshots of the psychedelic experience. This draws us directly into He Was A Friend Of Mine, another song that fell out of the rotation after the first few years and probably the one I personally miss the most, along with Viola Lee Blues. Jerry’s vocals and guitar solo only build upon what was happening in Doin’ That Rag. It’s a drippy walk through a folk ballad, showcasing the Dead’s personal signature wonderfully. When we arrive in Dark Star, it quickly makes everything that proceeded it seem like child’s play. The song comes on as if we’d been slipped a massively over-potent elixir brewed by some medicine man in the Central American jungle, and all the warnings we’d been given in preparation for the ensuing experience amount to not even the smallest level of readiness for what’s happening. Looking back on the show up to this point, we can only laugh at ourselves for having thought we were witnessing the psychedelic grandeur of the Grateful Dead. Dark Star is the real deal, a true game changer. Oddly, in the grand scheme of Grateful Dead things, the fact of the matter is that most of their music isn’t all that psychedelic. We all have probably been asked the question, “How is this psychedelic rock?” by people in our immediate circle who hear this music over our shoulder. I’ve been asked the question many times, and there’s little point in arguing. Tennessee Jed? Ramble On Rose? Promised Land, Big River? This list goes on and on – this isn’t hippie psychedelic music. I suppose those of us on the inside find it all tinged with the roots of psychedelic rock in some way. Such is the power of that portion of the Dead’s music that truly was psychedelia incarnate. And that, beyond doubt, was Dark Star in 1969. The Dead’s psychedelic preferences didn’t infuse Dark Star. Dark Star was the elixir itself. It was stepping into the inner chamber of a hidden palace to find a secret underground sea of mists, colors, and sounds all in a cosmic dance of intricate beauty. One taste, and you can forever onward begin to trace hints of it throughout everything else. Have you ever heard the strains of Dark Star while gently taking in a beautiful spring morning? That’s it. There’s little sense in road mapping 06/14/69’s Dark Star for you here. It’s a version that makes you very thankful that recordings of this band were made in such abundance. The idea of this performance having been lost to history as each note rang out without being recorded is unthinkable. The one thing I will mention in regard to the actual playing on 06/14 is that while the entire song quickly latches into the musical satori experience of the Grateful Dead’s living breathing musical muse, there is a near indescribable soul burning passage in the section that follows the first verse. As music revolves, and feedback swarms into all empty space around every sound, the dance between form and chaos overwhelms. This push and pull is never ending. It lays to waste any ability to retain a sense of separation between music and listener. You are drawn to listen because the music is finding itself within you. Dark Star is the muse within us all. It wakes itself as it plays. The illusion is that we believe Dark Star works on us. This is not true. It is seeking itself within us. We aren’t really there at all in the end. The more we can work to realize this absence of division, the more deeply we can release into the moment. The parallels to pure spiritual knowing here are not coincidental. The force of Being sings through many forms, and in the depths of Dark Star its musical voice is true. The thematic undercurrent which was Dark Star itself binds to everything in the Grateful Dead’s history. In that, it goes beyond any simple mapping from one song to another on a time line. In 1969 we were blessed to be exposed to the pulsing heart of the Dead’s magic. Once exposed, the beat echoes forever forward and back, in and out of music, in and out of self. 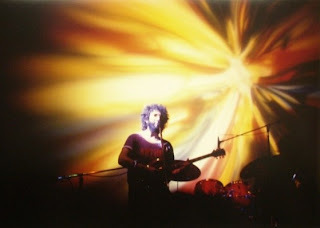 Dark Star is just something altogether elemental while also dwelling beyond most everything else imaginable. When Saint Stephen rolls out into The Eleven, there is a controlled frenzy to the intricate rhythm. As if taming something part swarm of bees, part lightning, and part molten furnace core, the Dead sear through time and space with an impossible control over something so ferocious. The music sweats. The pulse races. And in a great swirl of callioped color we find ourselves back at the start of the show as Lovelight steps back on the stage. Beautifully the song drops completely out into Space momentarily and then flashes back into view (one of my favorite elements of any Lovelight). Complete with opening band Aum's leader, Wayne "Tha Harpe" Ceballos, filling in a bit as a guest vocalist, and a drum solo in the midst of everything else, this closing bookend of Lovelight adds another 17 minutes on top of the 26 minute opening ride. Yes, Lovelight was in full bloom during the Summer of 1969. The tape we have sounds good, but also possesses something of a classic Dead bootleg quality to it. It isn’t culled directly off of a 10” master reel. It has that cassette feel to it, while not taking anything away from the quality of the recording – just a nice layer of listening pleasure reminding us how lucky we are to have the tape at all. "crafting pictures and imagery into a poetic mural of spiritual grace, lessons to learn, and endless snapshots of the psychedelic experience." Exactly, Noah. You nailed Hunter's genius right there. And teamed with JG's non-word-based genius, we all got lucky. Truth be known, that was one of the more difficult descriptions to articulate into words. I had to come back to rework it again and again before it aptly described what I've always taken for granted "knowing" about Hunter's work deep down. I listened to this at archive. I'd love to be able to get this from etree, but alas, there are no seeders at present. Could you help? Thanks for thinking about it, and for showing me new worlds of the Dead, and describing it so well. exciting tip...but alas, I think they've fixed that backdoor - anyone know of a different way in?